A gift economy, gift culture, or gift exchange is a mode of exchange where valuables are not traded or sold, but rather given without an explicit agreement for immediate or future rewards. This exchange contrasts with a barter economy or a market economy, where goods and services are primarily exchanged for value received. Social norms and custom govern gift exchange. Gifts are not given in an explicit exchange of goods or services for money or some other commodity. The nature of gift economies forms the subject of a foundational debate in anthropology. Anthropological research into gift economies began with Bronisław Malinowski's description of the Kula ring in the Trobriand Islands during World War I. The Kula trade appeared to be gift-like since Trobrianders would travel great distances over dangerous seas to give what were considered valuable objects without any guarantee of a return. Malinowski's debate with the French anthropologist Marcel Mauss quickly established the complexity of "gift exchange" and introduced a series of technical terms such as reciprocity, inalienable possessions, and presentation to distinguish between the different forms of exchange. According to anthropologists Maurice Bloch and Jonathan Parry, it is the unsettled relationship between market and non-market exchange that attracts the most attention. Gift economies are said, by some, to build communities, with the market serving as an acid on those relationships. According to anthropologist Jonathan Parry, discussion on the nature of gifts, and of a separate sphere of gift exchange that would constitute an economic system, has been plagued by the ethnocentric use of modern, western, market society-based conception of the gift applied as if it were a cross-cultural, pan-historical universal. However, he claims that anthropologists, through analysis of a variety of cultural and historical forms of exchange, have established that no universal practice exists. His classic summation of the gift exchange debate highlighted that ideologies of the "pure gift" "are most likely to arise in highly differentiated societies with an advanced division of labour and a significant commercial sector" and need to be distinguished from non-market "prestations". According to Weiner, to speak of a "gift economy" in a non-market society is to ignore the distinctive features of their exchange relationships, as the early classic debate between Bronislaw Malinowski and Marcel Mauss demonstrated. Gift exchange is frequently "embedded" in political, kin, or religious institutions, and therefore does not constitute an "economic" system per se. Property is not a thing, but a relationship amongst people about things. According to Chris Hann, property is a social relationship that governs the conduct of people with respect to the use and disposition of things. Anthropologists analyze these relationships in terms of a variety of actors' (individual or corporate) "bundle of rights" over objects. An example is the current debates around intellectual property rights. Hann and Strangelove both give the example of a purchased book (an object that he owns), over which the author retains a "copyright". Although the book is a commodity, bought and sold, it has not been completely "alienated" from its creator who maintains a hold over it; the owner of the book is limited in what he can do with the book by the rights of the creator. Weiner has argued that the ability to give while retaining a right to the gift/commodity is a critical feature of the gifting cultures described by Malinowski and Mauss, and explains, for example, why some gifts such as Kula valuables return to their original owners after an incredible journey around the Trobriand islands. The gifts given in Kula exchange still remain, in some respects, the property of the giver. In the example used above, "copyright" is one of those bundled rights that regulate the use and disposition of a book. Gift-giving in many societies is complicated because "private property" owned by an individual may be quite limited in scope (see § The commons below). Productive resources, such as land, may be held by members of a corporate group (such as a lineage), but only some members of that group may have "use rights". When many people hold rights over the same objects gifting has very different implications than the gifting of private property; only some of the rights in that object may be transferred, leaving that object still tied to its corporate owners. Anthropologist Annette Weiner refers to these types of objects as "inalienable possessions" and to the process as "keeping while giving". Malinowski's study of the Kula ring became the subject of debate with the French anthropologist, Marcel Mauss, author of "The Gift" ("Essai sur le don", 1925). In Parry's view, Malinowski placed the emphasis on the exchange of goods between individuals, and their non-altruistic motives for giving the gift: they expected a return of equal or greater value. Malinowski stated that reciprocity is an implicit part of gifting; he contended there is no such thing as the "free gift" given without expectation. Mauss, in contrast, emphasized that the gifts were not between individuals, but between representatives of larger collectivities. These gifts were, he argued, a "total prestation". A prestation is a service provided out of a sense of obligation, like "community service". They were not simple, alienable commodities to be bought and sold, but, like the "Crown jewels", embodied the reputation, history and sense of identity of a "corporate kin group", such as a line of kings. Given the stakes, Mauss asked "why anyone would give them away?" His answer was an enigmatic concept, "the spirit of the gift". Parry believes that a good part of the confusion (and resulting debate) was due to a bad translation. Mauss appeared to be arguing that a return gift is given to keep the very relationship between givers alive; a failure to return a gift ends the relationship and the promise of any future gifts. According to Chris Gregory reciprocity is a dyadic exchange relationship that we characterize, imprecisely, as gift-giving. Gregory believes that one gives gifts to friends and potential enemies in order to establish a relationship, by placing them in debt. He also claimed that in order for such a relationship to persist, there must be a time lag between the gift and counter-gift; one or the other partner must always be in debt, or there is no relationship. Marshall Sahlins has stated that birthday gifts are an example of this. [page needed] Sahlins notes that birthday presents are separated in time so that one partner feels the obligation to make a return gift; and to forget the return gift may be enough to end the relationship. Gregory has stated that without a relationship of debt, there is no reciprocity, and that this is what distinguishes a gift economy from a "true gift" given with no expectation of return (something Sahlins calls "generalized reciprocity": see below). The "generalized reciprocity" time-lag in recent years, also applies as an allowance for spontaneity and creativity that enables both parties to demonstrate love in surprising ways. In a market exchange, the giving party loses an item to gain income while the receiving party loses income to gain an item, a +1 -1 transaction that leads to 0 goodwill remaining on average. In a giving relationship, the giving party loses the item, but gains the joy of doing good for someone they appreciate, while the receiving party still gains not just something, but something that is tailored to their tastes, transaction value +1(receiver) +1(giver) -1(giver) +1(personalization as sign of love for the receiver) for a total of +2 goodwill added to the relationship. This expanding goodwill deepens social capital exchanged in close communities and leaves a "relationship bank" for community members to tap into when they are in need of help in the future. This belief is a core part of the culture of Burning Man. Jonathan Parry has argued that ideologies of the "pure gift" "are most likely to arise only in highly differentiated societies with an advanced division of labour and a significant commercial sector" and need to be distinguished from the non-market "prestations" discussed above. Parry also underscored, using the example of charitable giving of alms in India (Dāna), that the "pure gift" of alms given with no expectation of return could be "poisonous". That is, the gift of alms embodying the sins of the giver, when given to ritually pure priests, saddled these priests with impurities that they could not cleanse themselves of. "Pure gifts", given without a return, can place recipients in debt, and hence in dependent status: the poison of the gift. David Graeber points out that no reciprocity is expected between unequals: if you make a gift of a dollar to a beggar, he will not give it back the next time you meet. More than likely, he will ask for more, to the detriment of his status. Many who are forced by circumstances to accept charity feel stigmatized. In the Moka exchange system of Papua New Guinea, where gift givers become political "big men", those who are in their debt and unable to repay with "interest" are referred to as "rubbish men". The French writer Georges Bataille, in La part Maudite, uses Mauss's argument in order to construct a theory of economy: the structure of gift is the presupposition for all possible economy. Bataille is particularly interested in the potlatch as described by Mauss, and claims that its agonistic character obliges the receiver of the gift to confirm their own subjection. Gift-giving thus embodies the Hegelian dipole of master and slave within the act. Other anthropologists, however, refused to see these different "exchange spheres" as such polar opposites. Marilyn Strathern, writing on a similar area in Papua New Guinea, dismissed the utility of the contrasting setup in "The Gender of the Gift" (1988). Marcel Mauss was careful to distinguish "gift economies" (reciprocity) in market-based societies from the "total prestations" given in non-market societies. A prestation is a service provided out of a sense of obligation, like "community service". These "prestations" bring together domains that we would differentiate as political, religious, legal, moral and economic, such that the exchange can be seen to be embedded in non-economic social institutions. 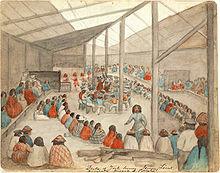 These prestations are frequently competitive, as in the potlatch, Kula exchange, and Moka exchange. The Moka is a highly ritualized system of exchange in the Mount Hagen area, Papua New Guinea, that has become emblematic of the anthropological concepts of "gift economy" and of "big man" political system. Moka are reciprocal gifts of pigs through which social status is achieved. Moka refers specifically to the increment in the size of the gift. Social status in the "big man" political system is the result of giving larger gifts than one has received. These gifts are of a limited range of goods, primarily pigs and scarce pearl shells from the coast. To return the same amount as one has received in a moka is simply the repayment of a debt, strict reciprocity. Moka is the extra. To some, this represents interest on an investment. However, one is not bound to provide moka, only to repay the debt. One adds moka to the gift to increase one's prestige, and to place the receiver in debt. It is this constant renewal of the debt relationship which keeps the relationship alive; a debt fully paid off ends further interaction. Giving more than one receives establishes a reputation as a Big man, whereas the simple repayment of debt, or failure to fully repay, pushes one's reputation towards the other end of the scale, "rubbish man". Gift exchange thus has a political effect; granting prestige or status to one, and a sense of debt in the other. A political system can be built out of these kinds of status relationships. Sahlins characterizes the difference between status and rank by highlighting that Big man is not a role; it is a status that is shared by many. The Big man is "not a prince of men", but a "prince among men". The "big man" system is based upon the ability to persuade, rather than command. Anthropologist David Graeber has argued that the great world religious traditions on charity and gift giving emerged almost simultaneously during the "Axial age" (the period between 800 and 200 BCE), which was the same period in which coinage was invented and market economies established on a continental basis. These religious traditions on charity emerge, he argues, as a reaction against the nexus formed by coinage, slavery, military violence and the market (a "military-coinage" complex). The new world religions, including Hinduism, Judaism, Buddhism, Confucianism, Christianity, and Islam all sought to preserve "human economies" where money served to cement social relationships rather than purchase things (including people). The Children of Peace (1812–1889) were a utopian Quaker sect. Today, they are primarily remembered for the Sharon Temple, a national historic site and an architectural symbol of their vision of a society based on the values of peace, equality and social justice. They built this ornate temple to raise money for the poor, and built the province of Ontario's first shelter for the homeless. They took a lead role in the organization of the province's first co-operative, the Farmers' Storehouse, and opened the province's first credit union. The group soon found that the charity they tried to distribute from their Temple fund endangered the poor. Accepting charity was a sign of indebtedness, and the debtor could be jailed without trial at the time; this was the "poison of the gift". They thus transformed their charity fund into a credit union that loaned small sums like today's micro-credit institutions. This is an example of singularization, as money was transformed into charity in the Temple ceremony, then shifted to an alternative exchange sphere as a loan. Interest on the loan was then singularized, and transformed back into charity. Non-commodified spheres of exchange exist in relation to the market economy. They are created through the processes of singularization as specific objects are de-commodified for a variety of reasons and enter an alternative exchange sphere. As in the case of organ donation, this may be the result of an ideological opposition to the "traffic in humans". In other cases, it is in opposition to the market and to its perceived greed. It may, however, be used by corporations as a means of creating a sense of endebtedness and loyalty in customers. Modern marketing techniques often aim at infusing commodity exchange with features of gift exchange, thus blurring the presumably sharp distinction between gifts and commodities. Engineers, scientists and software developers have created free software projects such as the Linux kernel and the GNU operating system. They are prototypical examples for the gift economy's prominence in the technology sector, and its active role in instating the use of permissive free software and copyleft licenses, which allow free reuse of software and knowledge. Other examples include file-sharing, open access, unlicensed software ... etc. Burning Man is a week-long annual art and community event held in the Black Rock Desert in northern Nevada, in the United States. The event is described as an experiment in community, radical self-expression, and radical self-reliance. The event forbids commerce (except for ice, coffee, and tickets to the event itself) and encourages gifting. Gifting is one of the 10 guiding principles, as participants to Burning Man (both the desert festival and the year-round global community) are encouraged to rely on a gift economy. 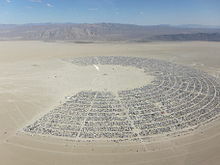 The practice of gifting at Burning Man is also documented by the 2002 documentary film "Gifting It: A Burning Embrace of Gift Economy", as well as by Making Contact's radio show "How We Survive: The Currency of Giving [encore]". According to the Associated Press, "Gift-giving has long been a part of marijuana culture" and has accompanied legalization in U.S. states in the 2010s. Voters in the District of Columbia legalized the growing of cannabis for personal recreational use by approving Initiative 71 in November 2014, but the 2015 "Cromnibus" Federal appropriations bills prevented the District from creating a system to allow for its commercial sale. Possession, growth, and use of the drug by adults is legal in the District, as is giving it away, but sale and barter of it is not, in effect attempting to create a gift economy. However it ended up creating a commercial market linked to selling other objects. Preceding the January, 2018 legalization of cannabis possession in Vermont without a corresponding legal framework for sales, it was expected that a similar market would emerge there. For a time, people in Portland, Oregon could only legally obtain cannabis as a gift, which was celebrated in the Burnside Burn rally. For a time, a similar situation ensued after possession was legalized in California, Maine and Massachusetts. Many anarchists, particularly anarcho-primitivists and anarcho-communists, believe that variations on a gift economy may be the key to breaking the cycle of poverty. Therefore, they often desire to refashion all of society into a gift economy. Anarcho-communists advocate a gift economy as an ideal, with neither money, nor markets, nor central planning. This view traces back at least to Peter Kropotkin, who saw in the hunter-gatherer tribes he had visited the paradigm of "mutual aid". In place of a market, anarcho-communists, such as those who inhabited some Spanish villages in the 1930s, support a currency-less gift economy where goods and services are produced by workers and distributed in community stores where everyone (including the workers who produced them) is essentially entitled to consume whatever they want or need as payment for their production of goods and services. English historian E.P. Thompson wrote of the moral economy of the poor in the context of widespread English food riots in the English countryside in the late eighteenth century. According to Thompson these riots were generally peaceable acts that demonstrated a common political culture rooted in feudal rights to "set the price" of essential goods in the market. These peasants held that a traditional "fair price" was more important to the community than a "free" market price and they punished large farmers who sold their surpluses at higher prices outside the village while there were still those in need within the village. A moral economy is thus an attempt to preserve an alternative exchange sphere from market penetration. The notion of peasants with a non-capitalist cultural mentality using the market for their own ends has been linked to subsistence agriculture and the need for subsistence insurance in hard times. James C. Scott points out, however, that those who provide this subsistence insurance to the poor in bad years are wealthy patrons who exact a political cost for their aid; this aid is given to recruit followers. The concept of moral economy has been used to explain why peasants in a number of colonial contexts, such as the Vietnam War, have rebelled. Some may confuse common property regimes with gift exchange systems. "Commons" refers to the cultural and natural resources accessible to all members of a society, including natural materials such as air, water, and a habitable earth. These resources are held in common, not owned privately. The resources held in common can include everything from natural resources and common land to software. The commons contains public property and private property, over which people have certain traditional rights. When commonly held property is transformed into private property this process alternatively is termed "enclosure" or more commonly, "privatization". A person who has a right in, or over, common land jointly with another or others is called a commoner. There are a number of important aspects that can be used to describe true commons. The first is that the commons cannot be commodified – if they are, they cease to be commons. The second aspect is that unlike private property, the commons are inclusive rather than exclusive – their nature is to share ownership as widely, rather than as narrowly, as possible. The third aspect is that the assets in commons are meant to be preserved regardless of their return of capital. Just as we receive them as a shared right, so we have a duty to pass them on to future generations in at least the same condition as we received them. If we can add to their value, so much the better, but at a minimum we must not degrade them, and we certainly have no right to destroy them. In his essay "Homesteading the Noosphere", noted computer programmer Eric S. Raymond said that free and open-source software developers have created "a 'gift culture' in which participants compete for prestige by giving time, energy, and creativity away". Prestige gained as a result of contributions to source code fosters a social network for the developer; the open source community will recognize the developer's accomplishments and intelligence. Consequently, the developer may find more opportunities to work with other developers. However, prestige is not the only motivator for the giving of lines of code. An anthropological study of the Fedora community, as part of a master's study at the University of North Texas in 2010-11, found that common reasons given by contributors were "learning for the joy of learning and collaborating with interesting and smart people". Motivation for personal gain, such as career benefits, was more rarely reported. Many of those surveyed said things like, "Mainly I contribute just to make it work for me", and "programmers develop software to 'scratch an itch'". The International Institute of Infonomics at the University of Maastricht in the Netherlands reported in 2002 that in addition to the above, large corporations, and they specifically mentioned IBM, also spend large annual sums employing developers specifically for them to contribute to open source projects. The firms' and the employees' motivations in such cases are less clear. ^ "Christmas wish list and giving traditions". DreamList.com. Retrieved 24 July 2018. ^ Arellano, Gabriela. "Hot Embers News: Gratuity and Gratitude as Game Changers." N.p., 13 Nov. 2015. Weborn 04 Dec. 2015. ^ "Gifts and Commodities | Chapter III: Gifts and commodities: Circulation". haubooks.org. Retrieved 2016-12-21. ^ Eisenstein, Charles (2007). "2". The Ascent of Humanity. Harrisburg, PA: Pananthea Press. ISBN 978-0977622207. Archived from the original on 2013-02-07. Retrieved 9 February 2013. ^ Graeber, David (2001). "Marcel Mauss Revisited". Toward an Anthropological Theory of Value. Basingstoke: Palgrave. p. 153. ^ Rus, Andrej (2008). "'Gift vs. commoditiy' debate revisited". Anthropological Notebooks 14 (1): 81-102. ^ "ORGANS FOR SALE: CHINA'S GROWING TRADE AND ULTIMATE VIOLATION OF PRISONERS' RIGHTS". June 27, 2001. Retrieved February 12, 2019. ^ Barro, Josh. "Can Washington's Gift Economy in Marijuana Work?". ^ "The Rolling State to Legal Pot: Washington, D.C." 2018-04-25. Retrieved 2018-06-19. ^ Ab Hanna (September 29, 2017), "Will Vermont Be the Next State to Legalize Marijuana? ", High Times, The current Vermont bill does not allow for the retail sale of cannabis. So if it goes forward with a legal market, it would be similar to that of District of Columbia. ^ Tuttle, Brad (June 29, 2015). "Oregon Is Celebrating Marijuana Legalization With Free Weed". Time. ISSN 0040-781X. OCLC 1311479. Retrieved July 2, 2015. ^ Joshua Miller (December 14, 2016), "It's official: Marijuana is legal in Massachusetts", Boston Globe, Giving away up to an ounce of the drug without remuneration or public advertisement is OK. "Gifting" pot and then receiving payment later, or reciprocal "gifts" of pot and items of value: illegal. ^ Heylighen, Francis (2007). "Why is Open Access Development so Successful?". In B. Lutterbeck; M. Barwolff; R. A. Gehring. Open Source Jahrbuch. Lehmanns Media. ^ "Free/Libre and Open Source Software: Survey and Study". International Institute of Infonomics, University of Maastricht and Berlecon Research GmbH. 2002. Archived from the original on 21 August 2012. Retrieved 19 March 2012. ^ D. Anthony, S. W. Smith, and T. Williamson, "Explaining quality in internet collective goods: zealots and good samaritans in the case of Wikipedia", THanover : Dartmouth College, Technical Report, November 2005.